In honor of my on-going, dramatic, hacking cough that makes me sound more like a dying opera character than a girl who is ready to go salsa dancing at a moment’s notice, I offer you a round about of Puccini’s La Boheme, whose Mimi dies of TB in one of the world’s most popular operas. 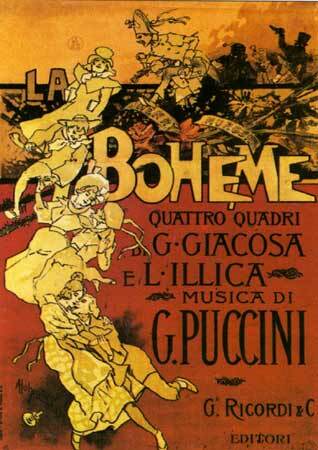 La Boheme premiered in 1896 in Turin by Toscanini and has been played a zillion times around the world. Seriously. A zillion. But even after all the times I have heard it and seen it performed, I still love to hum along. It is just that lovely. So lovely that Puccini inspired others to write stories around beautiful, ill-fated women with disgusting coughs. Baz Luhrman’s Moulin Rouge with Nicole Kidman and Ewan McGregor took Mimi from the hovels of Montmartre to its highest level of elegance: a garden with a giant elephant and an iconic windmill. Then there’s Rent where Mimi and Roger are struggling to make their way in Downtown NYC when it was still dangerous and cheap to live there. La Boheme is a great example of how artists are inspired by other artists and how all of us are working in concert with those who came before us, striving to create works that are relevant to our own time. So, here’s what I’m going to do. This post has two sections. Section One has scenes related to Mimi meeting Rodolfo. First, you’ll be introduced via La Boheme and then by a modernization (Rent). Section Two has scenes related to Mimi’s death, one Puccini and one modernization (Moulin Rouge). Let’s first meet sweet Mimi, the seamstress. Here is Angela Gheorghiu (my current fave soprano) singing the famous aria where she introduces herself to Rodolfo, the poet. Now, here’s a different version – Mimi from Billy Aronson and Jonathan Larson’s Rent. In this version, her occupation is not so delicate — Mimi is an HIV-positive stripper. At any rate, in this clip you see Mimi meet Roger by asking for a candle – there’s no light or heat in her apartment. Check out Rosario Dawson in this clip. She is fantastic. Here is Angela Gheroghui and Roberto Alagna (hello hot opera singer!) singing Puccini’s final scene where TB ridden Mimi dies in his arms. Listen carefully and you will hear snippets of the earlier aria in this finale. This one is a little long, but it’s worth the wait. Now, here is Nicole Kidman and Ewan McGregor singing “Come What May” from Moulin Rouge. I love this clip because she actually hacks on stage and I feel it really sums up this post perfectly. Grab a handkerchief!